I’m no good with flowers — cut or live. As far as I can tell, the secret to a green thumb is replacement. Mrs. E. fares better and is in charge of things green here at the manse. Since I don’t have to think about them, I rarely remember to do anything floral for a centerpiece. That’s why I was very pleased to read about an easy, and dramatic, solution to my decorating dilemma. And, since they are live, Mrs. E. has promised to keep them alive long enough for us to transplant outside when the weather is more cooperative. In the meantime, I continue to enjoy them and imagine they will take the sting out of losing the Christmas tree after Epiphany. An easy and elegant solution to the problem of arranging cut flowers and at least a bit more cost-effective. The last trick I’ll share from the party is to spread the wealth. White, red and sparkling wine was set up in porcelain beverage tubs in the dining room and the kitchen. The full bar was concentrated in the bar room. Although there were seventy people here, there was no real bottleneck around the booze. With age, wisdom. I’ll get there one day. 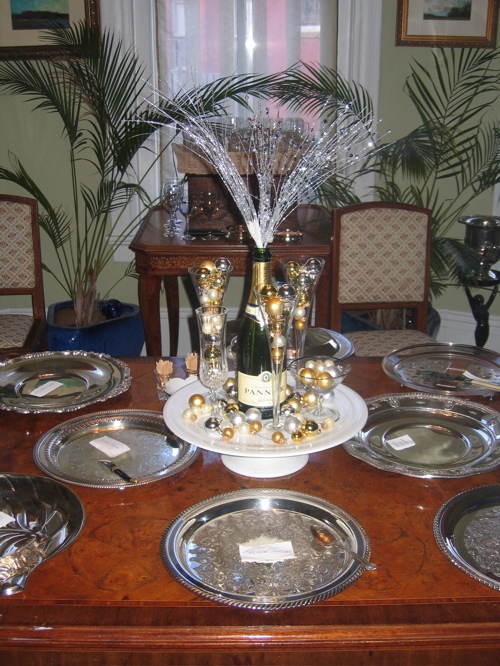 This entry was posted in Entertaining and tagged An Aesthete's Lament, Entertaining, hydrangea, New Year's decorations. Bookmark the permalink. Yes, yes, yes! I always fill my house with white flowers, especially hydrangeas, during the first week of a new year. It acts as a bit of a visual palette cleanser after all the rich Christmas colour. The hydrangeas are a great idea. I just disposed of the last of the mini poinsettias that have filled our home for the Christmas season. I was thinking an orchid or two to help ease out the holiday clutter, but just might go for the hydrangeas instead. For New Years, I do love white flowers along with silver and gold metallic and “feathers” are also quite fun. You can save things from year to year and simply add them to a white arrangement to maintain an easy and elegant centerpiece. Lillies are also stunning and add a heavenly bouquet to the air. Wonderful hydrangeas and beautiful–but they don’t have any fragrance. 🙁 Men don’t notice fragrance so much, but it is such a subtle and elegant thing. Ladies notice–at least ladies with fine-tuned noses. Scented candles interfere with the smell of the food (except for the powder room) . . . but lilies and paperwhites smell clean and not overly sweet–like soap only better. They make the air smell clean even more than fragrant. Not sure how to solve this complicated issue! Nothing beats the look of hydrangeas! 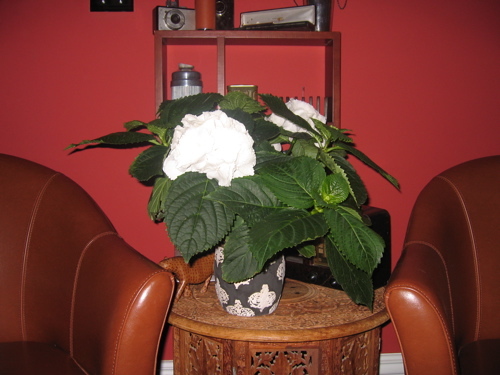 Hydrangeas and camelias are my favorite flowers; we always have a pot os something growing in the sunroom – or an arrangement in the entrance hall. But never on the dining table. Why? The table is reserved for the smell of delicious food which must never be in competition with floral smells. Worse, one should never place a container of dirt on one’s dining table. I don’t give one hoot what is growing. It isn’t done.